Thirty-seven new beds are the first of up to 240 expected by 2018. (Rick Egan | The Salt Lake Tribune) Mayor Ben McAdams talks about the current efforts to move eligible Operation Rio Grande arrestees out of jail and into treatment, during a news conference at the First Step House, Thursday, September 7, 2017. (Rick Egan | The Salt Lake Tribune) Mayor Ben McAdams talks about the current efforts to move eligible Operation Rio Grande arrestees out of jail and into treatment, during a news conference at the First Step House, Thursday, September 7, 2017. (Rick Egan | The Salt Lake Tribune) Mayor Ben McAdams jokes with speaker Greg Hughes, on the current efforts to move eligible Operation Rio Grande arrestees out of jail and into treatment, during a news conference at the First Step House, Thursday, September 7, 2017. (Rick Egan | The Salt Lake Tribune) Salt Lake County Sheriff Rosie Rivera speaks along with Mayor Ben McAdams, on the current efforts to move eligible Operation Rio Grande arrestees out of jail and into treatment, during a news conference at the First Step House, Thursday, September 7, 2017. (Rick Egan | The Salt Lake Tribune) Mayor Ben McAdams talks about the current efforts to move eligible Operation Rio Grande arrestees out of jail and into treatment, during a news conference at the First Step House, Thursday, September 7, 2017. (Rick Egan | The Salt Lake Tribune) Mayor Jess Anderson, Utah Department of Public Safety makes a statement about the current efforts to move eligible Operation Rio Grande arrestees out of jail and into treatment, during a news conference at the First Step House, Thursday, September 7, 2017. (Rick Egan | The Salt Lake Tribune) Mayor Ben McAdams talks about the current efforts to move eligible Operation Rio Grande arrestees out of jail and into treatment, during a news conference at the First Step House, Thursday, September 7, 2017. (Rick Egan | The Salt Lake Tribune) McKaye Christianson, Legal Defenders Association, talks about the current efforts to move eligible Operation Rio Grande arrestees out of jail and into treatment, during a news conference at the First Step House, Thursday, September 7, 2017. (Rick Egan | The Salt Lake Tribune) McKaye Christianson, (left) of the Legal Defenders Association, talks about the current efforts to move eligible Operation Rio Grande arrestees out of jail and into treatment, during a news conference at the First Step House, as Salt Lake Mayor Ben McAdams and Speaker Greg Hughes look on. Thursday, September 7, 2017. (Rick Egan | The Salt Lake Tribune) Speaker Greg Hughes, talks about the current efforts to move eligible Operation Rio Grande arrestees out of jail and into treatment, during a news conference at the First Step House, Thursday, September 7, 2017. (Rick Egan | The Salt Lake Tribune) Salt Lake County Mayor Rosie Rivera speaks along with Mayor Ben McAdams, on the current efforts to move eligible Operation Rio Grande arrestees out of jail and into treatment, during a news conference at the First Step House, Thursday, September 7, 2017. (Rick Egan | The Salt Lake Tribune) Shawn McMillen, First Step House, makes a statement about the current efforts to move eligible Operation Rio Grande arrestees out of jail and into treatment, during a news conference at the First Step House, Thursday, September 7, 2017. (Rick Egan | The Salt Lake Tribune) Mayor Jess Anderson, Utah Department of Public Safety makes a statement about the current efforts to move eligible Operation Rio Grande arrestees out of jail and into treatment, during a news conference at the First Step House, Thursday, September 7, 2017. Less than 24 hours before officers swarmed every last nook of Salt Lake City’s Rio Grande neighborhood, on Aug. 13, Salt Lake County Mayor Ben McAdams was still seeking assurances that the crackdown would be followed by a hand up. A spur-of-the-moment Sunday afternoon meeting with Lt. Gov. Spencer Cox put McAdams’ mind at ease, though, and he announced Thursday that residential drug treatment beds are now available through Operation Rio Grande. Starting 6 a.m. Thursday, lawyers and social workers were assessing county jail inmates to determine if they were willing and eligible candidates for 37 new treatment beds. “I‘m sure they’ll be full in a matter of days,” McAdams said. Two hundred more treatment beds are promised during the two-year operation. 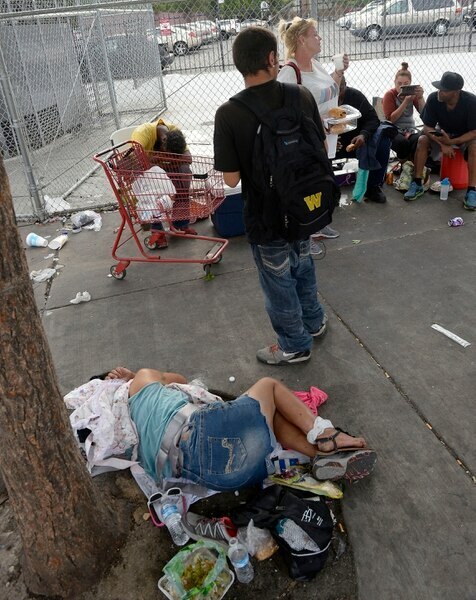 Behavioral-health treatment has been referred to as ”Phase Two” of the $67 million collaboration among the state, county and city to reduce lawlessness and rampant drug dealing near Salt Lake City’s downtown homeless shelter. Cox proposed in a late-July email that Salt Lake City Mayor Jackie Biskupski would lead the effort — which ”seems to be one of the biggest sticking points/potential roadblocks,” he wrote — while McAdams pursued jail beds. But the mayors would swap roles. The county is the coordinator of federal grant funds for local housing and homeless service providers, and the broad outline of Phase Two resembles an unsuccessful bid it made earlier this year for more than twice its per capita share of the state’s Justice Reinvestment Initiative grant funds. Inmates will be assessed at the jail for substance abuse and mental-health needs and then referred either to an existing county criminal justice program or a new, Operation Rio Grande-specific drug court that’s expected to open next Wednesday. Drug-court participants would plead guilty on the condition that their record be scrubbed clean if they completed treatment and other conditions set by the judge. Judge Dennis Fuchs will preside over the new court for two days, after which he will be relieved by assigned 3rd District Judge Todd Shaughnessy. More than 1,000 arrests had been made before a single residential-treatment bed became available through Operation Rio Grande — an order of events that groups such as the American Civil Liberties Union of Utah say has exposed the priorities of policymakers. McAdams, himself, had feared that mass arrests would exacerbate the area’s problems by creating more barriers to housing and employment for low-level offenders in the grip of drug addiction. Department of Public Safety Maj. Jess Anderson said that as of midday Thursday, more than 1,023 jail bookings had been recorded during Operation Rio Grande. 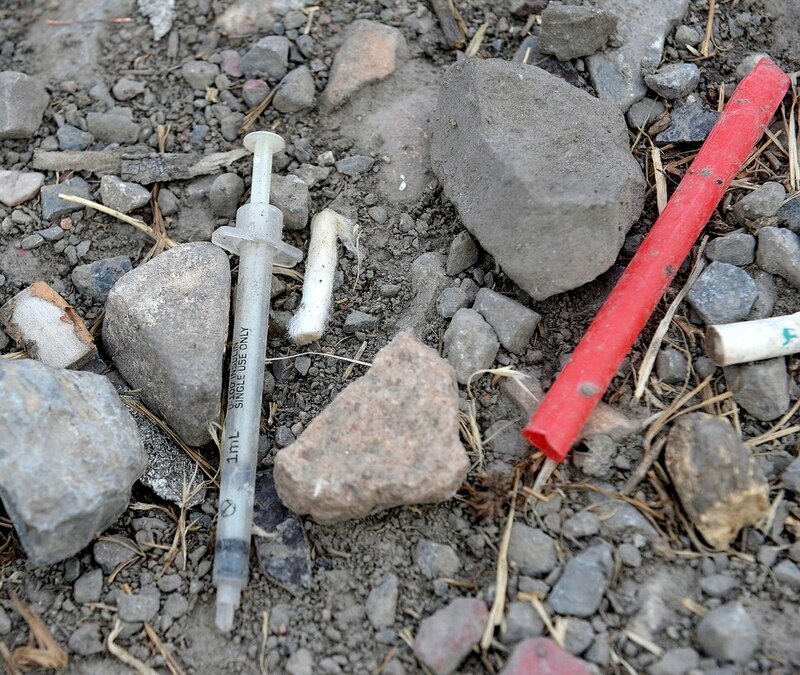 “Many of these folks have been released already, and we will see them at our doors again unless there‘s an alternative,” said Salt Lake County Sheriff Rosie Rivera, explaining the value of the newly available treatment beds. 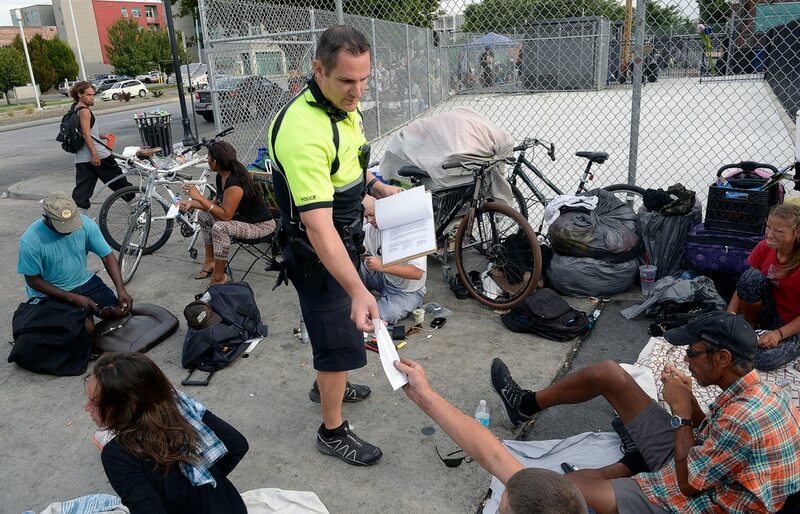 (Al Hartmann | The Salt Lake Tribune) Salt Lake City Police check identifications and made arrests in a sweep of the Rio Grande neighborhood in downtown Salt Lake City Thursday September 29. Here they handcuff and search a woman on the block of 500 West between 300 and 400 South where many homeless spend time during the day in lawn chairs, sleeping bags and their suitcases. Anderson said that of 891 people who had been booked as of Monday, 57 were arrested twice, six were arrested three times and two were arrested four times. Rivera said 676 people have been released from jail after being booked as part of Operation Rio Grande. While the first batch of beds is reserved for those booked into jail, the county may later make Rio Grande-associated treatment beds available through other venues, said Criminal Justice Advisory Council coordinator Noella Sudbury, like The Road Home or the Salt Lake City Police Department’s Community Connection Center. First Step House Executive Director Shawn McMillen said his counselors and therapists reported after a smaller-scale version of Operation Rio Grande — last fall’s Operation Diversion — that many who entered treatment showed a level of trauma and stress that you would expect to see in a war zone. The wait for one of the county’s other publicly funded treatment beds is upward of six months, and McMillen said he’s seen people try to wait it out on the streets. ”For most people, their condition worsens, and some, sadly, never make it into treatment because their addiction leads to death,” he said. Of the 37 treatment beds opened Thursday, 26 were provided by Odyssey House, 10 by First Step House and one by House of Hope. The county expects to add 24 more beds at Odyssey House later this month, and by the end of the year hopes for 180 between Odyssey House and First Step House. Odyssey House plans to renovate its administrative building to create space for 100 beds, while First Step House hopes to acquire a new facility that would host 80 beds. To pay for much of the treatment — 63 beds in Operation Diversion cost $2.6 million per year — Operation Rio Grande’s leaders are counting on the federal government to approve the state’s Medicaid expansion waiver, which would extend coverage to many homeless people in need of mental health or substance abuse treatment. Officials have said they expect approval by Jan. 1, 2018, and that it may come sooner than that. Correction: Judge Dennis Fuchs is an active senior judge in the Third District. An earlier version of this story indicated Fuchs had retired. Fuchs will also serve for two days, according to Utah State Courts. An earlier version of this story said Fuchs would serve for two to three weeks.